This book is in CD form and is stored in PDF format. You can print out what ever pages you need to have handy. An Abobe Acrobat 4.0 is necessary to view this format. A reader may be included in the CD if you have told me what your operating system is (windows 95, 98....etc). It is also available for free download at Adobe I have chosen this format to skip the delays and problems in traditional publishing (and to save you money). If you do not have a CD-Rom drive in your computer I can furnish the content on either regular floppy disks (takes quite a few), or printed in paper form. All content is protected by Copyright laws and any reproduction without the express written permission of Shane Smith is against the law. This is a book (CD really) that comes from both years of experience and from having literally hundreds of requests for places to get information like this. 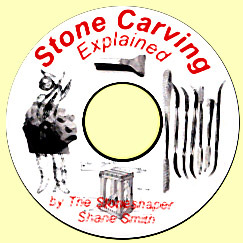 Unless you are an accomplished stone sculptor with little left to learn about the art, you will be following my footsteps and it's always nice to know what you are going to be stepping in. This book is for the lover of life, beauty and new challenges. It's for the person that may only finish one piece for a loved one or go on to a lifetime in communion with stone. Seek the heart of the stone like a child exploring nature. Approach it with wonder and an openess to learning, and the odds are that you will be as stone struck as I am. Instructors E-mail me to find out about discount rates! PayPal works in most countries now. Since the costs of mailing to these countries are close I have decided to make most of them a single rate. Please check below for your country. If it is not listed please E-mail me with your address first. I will find out the shipping charges for your country and add it to the ordering list below. Or have a US Bank draft made out in the amount of $19.00 ($15.00 + $4.00 shipping) and send it to the above address.